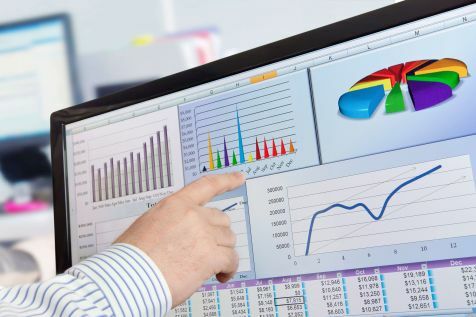 The need for the accurate web analytics data & richer business insights is increasing. Given the importance of web analytics data, it is essential to conduct a web analytics audit every year (or just after any major system upgrade). 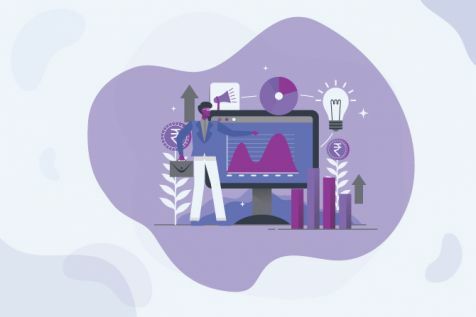 An agile & effective web analytics audit can contribute immensely to reliability of data, without enumerating the many benefits to the overall business. Should I trust the accuracy of the Web Analytics data accuracy? Are we using our Analytics package to its full capability? Why is the Analytics application showing different values than the back-end systems? Which one is correct? Did the system migration last year have any lasting impact on the web analytics? Do we have a like-for-like comparison on YOY metrics? Is the Analytics implementation optimized to and aligned to the online business strategy? There are many simple analytics tools & add-ons available, through which you can ensure correct deployment of the GATC. Some of the popular ones are: GA debugger, WASP, Google Tag assistant, GTM debugger tool, Firebug. During the process, you need to document your progress. Thus, it should contain the brief explanation of all the current state issues with a summary analysis. This vision & roadmap along with the timeline will eventually serve the foundation for further actionable recommendations. 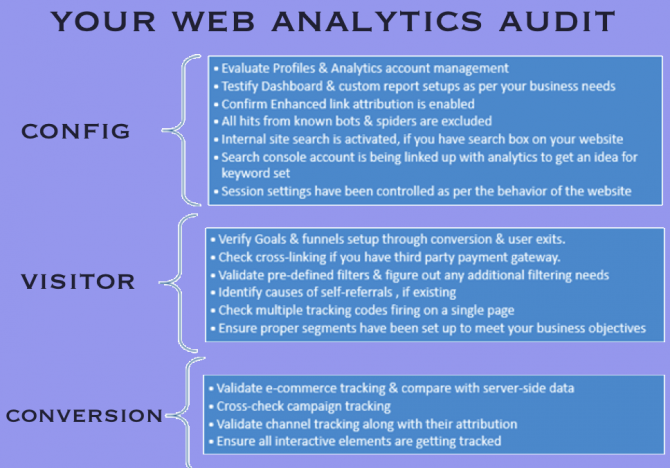 How to Structure your Web Analytics Audit? Test whether all the properties owned by the single person/organization are getting tracked into one analytics account only. Make use of filters in situations where you need distinct report views for the property having blogs, website, mobile platform. Separate properties should only be created when you have the multiple subdirectories/sub-domains within a single domain but each department wants to control & track their sections independently. Make sure, if you need more properties/views to fulfill your more business needs, consider removing un-necessary properties & views first rather than considering new analytics account provided the fact that each Analytics account can have up to 50 properties and each property can have up to 25 views. Make sure you keep unfiltered data in one view which should be including all traffic generating from sub-domains/sub-directories, mobile website so that a single organization can get to know how much in total output they are getting to their website. Search console reports are available within analytics through account linking. Internal site search is activated with relevant search query parameters. Ensure that goals & conversion funnels have been setup properly so that navigation impacts are measured. Funnels must not have any irrelevant high number of exits. Verify that cross-domain setups have been done if your payment gateway is on third party domain. Even if your ultimate goal is to treat two different websites being treated as similar in terms of traffic you need to cross-link your domains in that case. Ensure proper segments are defined as per your business goal like brand & non-brand traffic, mobile/desktop traffic. Ensure that you are not getting any referral visitor from your own website. There might be many causes for self-referrals like untagged landing pages, customized cookie settings, cross domain issues. Keep a check on extremely low bounce rates which can be caused due to firing of un-necessary events. Verify double counting of the visitors is not going on which might be causing due to multiple tracking codes on the page. Validate e-commerce tracking and compare with server-side data. Ensure that your product revenue matches with the internal database values. Cross-check that campaign tracking is correct and utilizing proper UTM (source, campaign, medium, term) campaign parameters. Validate channel tracking (i.e. ensure all referring sources are attributed correctly) including organic search channel, display ads, social media, affiliate networks, etc. Unused or Obsolete Tracking tags – While marketing campaigns might require tracking tags, there is rarely a process to remove the tracking tags after they are no longer in use. Exclusion of web traffic generated from offices, staging sites – Visits to a website by employees should ideally be removed.